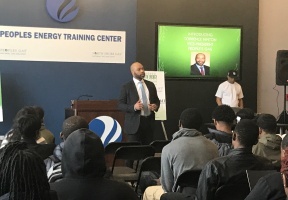 Peoples Gas partnered with Legacy Nexus Foundation to host the 2nd Annual Chicago Youth Energy Technology Conference: Awareness and Access Campaign 2018 on Friday, April 6. The event was held at the new Peoples Energy Training Center, at 4228 W. 35th Place, in Chicago’s Little Village neighborhood. 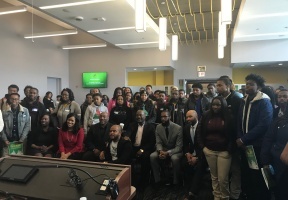 Over 100 high school 11th and 12th grade students from John Marshall High School, Chicago Vocational Career Academy, Dunbar High School and Olive Harvey Middle College were in attendance. The students were selected by STEM educators and administrators, based on their strong aptitudes and focus in STEM curriculum. The conference served as a platform for students to learn how to access energy and technology sector educational and career opportunities, while employees from various energy companies establish relationships with the future labor pool that will be entering the workforce in the next five years. The program kicked off with a keynote address from Mr. Hinton, and was followed by two workshops. The first, introduced students to equipment used to perform various energy and tech-related jobs. The second workshop consisted of a discussion regarding techniques to overcome barriers for career opportunities.